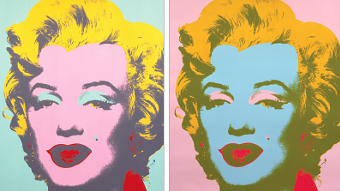 SOME of the most iconic images of modern times are going on display in Woking as The Lightbox Gallery explores Warhol and the World of Pop Art. The main attraction at the exhi-bition will be 10 multi-coloured screen prints of Marilyn Monroe created by Andy Warhol in 1967. The images will be instantly recognisable as they’ve become among the most famous symbols of pop art, along with other Warhol classics such as his screen prints of Elvis Presley, Jackie Kennedy, Liz Taylor and others. But curator Michael Regan says there’s nothing like seeing the originals – even if you have a print on your wall at home. “What visitors will see is that Warhol took that one image and reproduced it many, many times – but each time it was different,” he explains. “Each Marilyn is unique. He didn’t mass-produce them, each one has different colours and the way the lips or eyebrows are accentuated is different. It’s very subtle. “He started making them in the early 1960s using screenprinting, and there are thousands of them but, yes, they’re all different. Gathering artworks for the World of Pop Art exhibition was tough because the limited Lightbox bud-get meant that only works already in collections in the UK could be considered. “With someone like Andy Warhol, it’s a problem,” says Michael. “But the Tate has a very good holding so we’ve been able to borrow an important collection of Marilyn images. “We’ve also got some private loans and what’s unusual is that we have included a lot of early Warhol from when he worked as a textile designer and a graphic designer. Examples of later rare applied artworks by Warhol, such as a Campbell’s Soup Can paper tote bag (1966) and an LP record sleeve for the Velvet Underground featuring the famous pop art banana motif (1967) will also be in the exhibition. Warhol paved the way for other pop artists to follow, and the curator explains: “He had a clarity about looking at consumerism and viewing it initially from the point of view of a graphic designer. “He was clever enough to be able to use the repeated motifs you see in his Campbell’s soup can images, for instance, and turn them into art. He was one of the first to do that in a way that people could actually understand. The Lightbox exhibition also has other big American names from the pop-art movement, such as Roy Lichtenstein, Claes Oldenburg, James Rosenquist and Jasper Johns, but also lesser-known artists such as Billy Apple and Ray Johnson. There are also works from France and Iceland to illustrate that it was a truly international movement. WARHOL and the World of Pop Art opens at the Lightbox Gallery, Woking, on Saturday (July 25) and runs until November 1.